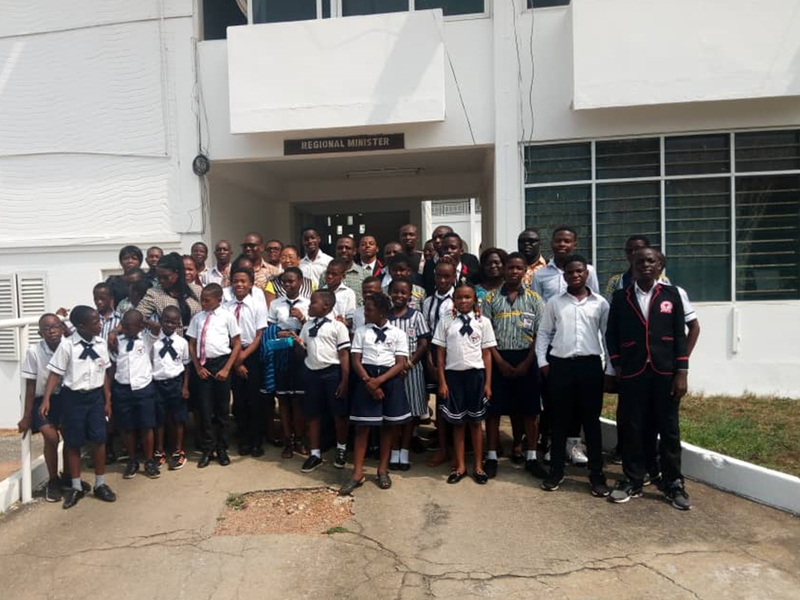 The University of Cape Coast Basic School has hosted 26 pupils and 4 staff of Cours Lumière and Canadian International School of Lomé from Saturday, 16th February 2019 to Saturday, 2nd March 2019. The visit of students of the two schools forms part of the exchange programme for Bilingual immersion (English and French) the three institutions have started since November 2017. The two-week immersion program was preceded by a visit to Lomé by 30 pupils of the University of Cape Coast Basic School from Saturday, 2nd February 2019 to Saturday, 16th February 2019. The exchange programme between the three institutions is characterized by a two-way immersion type: a home immersion where pupils of the visiting school are hosted by families of the host school for an intensive impersonal and informal immersion in the foreign language; and a school immersion where visiting pupils are integrated into classrooms of their counterparts so as to receive formal instruction in the foreign language, irrespective of the subject area. Thus, pupils who took part in the trips both in Togo and Ghana benefitted immensely from a complete French language immersion (for Ghanaian students) and English language immersion (for Togolese students) for a full month. This exposure has had a tremendous impact on their listening, speaking, reading and writing skills of both languages. Special classes for language proficiency in French and English were organized for visiting pupils in Lomé and Cape Coast. The French classes in Lomé were handled by Institut Français of Lomé while the English classes were taught by Alliance Française of Cape Coast who respectively dispatched their personnel to the schools for the lessons. Beside the special classes, pupils were integrated into various classes to study various subjects in the foreign language. Pupils took part in subjects such as French, English, Mathematics, Science, Creative Arts, Home economics, ICT, Chinese and Physical Education. They also participated in Club activities such as Singing and Dancing, Reading, Drama, Orregami and Swimming. During the period, teachers who accompanied the pupils had the opportunity to observe lessons as well as teach some of the lessons in English language, French, and Mathematics at different levels. Through the experiences, teachers acquired new pedagogical strategies used in teaching and learning and this impacted them positively. Other extra-curricular activities of the 2019 edition of the exchange programme include: visits to museums and historical monuments such as the Slave House of Agbodrafor and the Cape Coast Castle, swimming and funfair at O’Lodge and Elmina Beach Resort, and visits to places such as the zoo of Lomé, the University Water Bottling Company, the University Printing Press and the University Farms. A courtesy call was paid to the Ghana Ambassador to Togo by pupils of UCC Basic School whilst their counterparts from Togo made a similar visit to the Central Regional Minister on their arrival to Cape Coast. This novelty of exchanging pupils to learn French and English by our pupils all started with an initiative by the Departments of English and French of the University of Cape Coast. In June 2017, the founders of Cours Lumière visited Ghana. During their visit, the idea of establishing an exchange programme for the basic schools (UCC Basic Schools and Cours Lumière) were discussed. The visit was followed by the signing of a memorandum of understanding (MoU) by University of Cape Coast and Cours Lumière. In November 2017, the first batch of 8 pupils from Cours Lumière visited Ghana for one week. During their visit, they were hosted by Ghanaian parents who took them into their home and treated them like their biological children. After the successful pilot hosting of the first batch of pupils, both schools agreed to allow the first batch of 30 pupils from Ghana to travel to Togo in March 2018 and vice versa. Around the same period, Canadian International School of Lomé had sent a two-person delegation to UCC to establish a partnership. The meeting of the delegation with stakeholders of the exchange programme and personnel of the Centre for International Education (CIE) resulted in the signing of a second MoU with the University. This gave Canadian International School of Lomé the chance to participate in this current 2019 Exchange Programme. The 2019 edition of the exchange programme was climaxed by colorful and grand closing ceremonies, which provided pupils of partner institutions the opportunity to exhibit their skills in both languages through a variety of performances such as drama, choreography, music and traditional dance, among others. The ceremonies were also used to bring together host families and other stakeholders who played very important roles in the organization of this year’s exchange programme. We would like to extend our profound gratitude to all stakeholders, especially the Host families in Togo and Ghana who sacrificed a lot for the safe upkeep of the visiting pupils; the Management of Cours Lumière and Canadian International School of Lomé; the Directorate of Academic Affairs of the University of Cape Coast for their sponsorship; the Division of Legal Consular and General Services, the Centre for International Education, the Department of English, the Department of French, the Campus Broadcasting Services (ATL FM), the Transport Section, the UCC Printing Press, UCC Mineral Water (U-SPLASH), the Parents and Teachers’ Associations, School Management Committee and finally Staff and Teachers of UCC Basic School.